BSWORLD[dot]COM – Britney Spears World | Buon Compleanno Jayden! Home News Buon Compleanno Jayden! 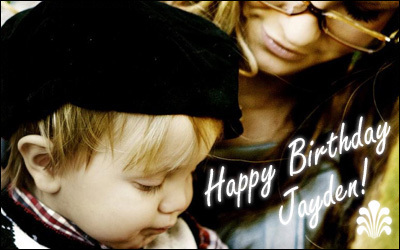 Tanti auguri piccolo Jayden… Happy birthday to you!!! TANTI AUGURI A TE!! TANTI AUGURI A ME TANTI AUGURI A JAYDEN!TANTI AUGURI TE!E LA TORTA A ME!!!!!!!!! AUGURIIIIIIIIIIIIIIIIII!!! !PICCOLO jAYDEN!!!!!!!!!!!!!!!!!!!!! !TI VOGLIAMO TANTO BENE!! !SPERò KE TI DIVERTIRAI TANTTISSIMOO OGGI E GIORNO IMPORTATE PER LA VOSTRA MAMMA TI VOGLIO TANTO BENE JAYDEN BUON COMPLEANNO!!!BEBY!!!!!!!!!! AUGURI JJ X I TUOI 2 ANNI…..